Oral hygiene is of the utmost importance and should be a priority in your anti-aging strategies. Although as many as half of older adults lost their teeth in earlier generations, nowadays it is common for people to keep their teeth into old age. However, maintaining healthy teeth and gums can be challenging at a stage in life where physical, cognitive or financial limitations can make good oral hygiene and regular professional care difficult to maintain. 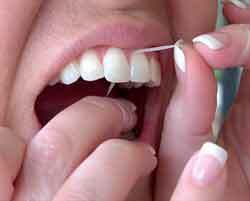 Teeth are lost due to tooth decay and gum disease, rather than aging, although oralproblems may increase with age because poor vision, chronic disease and physical or cognitive problems can reduce the effectiveness of flossing and brushing. Added to this, older people often have problems with saliva production and receding gums. There is more at stake for oral health than just having an attractive smile and cavity-free teeth. Oral problems can lead to needless pain and suffering; difficulty speaking, chewing and swallowing; loss of self-esteem; and higher health care costs. Periodontal (gum) diseases are associated with diabetes, and there is emerging evidence of a relationship between severe periodontal disease and cardiovascular disease and stroke. In addition, mouth and throat cancers can result in disfigurement and death. Dry mouth, or xerostomia, increases the risk for tooth decay and mouth infections. It also can cause problems with tasting, chewing, swallowing, and talking. Changes in hormonal levels as well as certain medications may impede saliva production in elderly adults. Saliva is important as it protects the teeth against bacteria and also provides important minerals, such as calcium, phosphates and fluoride to help rebuild tooth enamel after it has been attacked by decay causing bacteria. (Oral Health in America: A Report of the Surgeon General 2000). Many medications, for example antihistamines, diuretics, and antidepressants as well as medical treatments such as radiation or chemotherapy can cause problems with fabricating saliva. Dry mouth can also be a symptom of certain conditions such as diabetes or Parkinson’s disease. To help with this problem health professionals recommend drinking extra water and avoiding sugar, caffeine, alcohol and tobacco. There are also certain products available commercially to lubricate the mouth. Chewing gum can also help to stimulate the production of saliva. Oral hygiene is obviously important to anyone suffering from this condition. The combination of dry mouth, receding gums, poor oral hygiene is therefore of the utmost importance and should be a priority in your anti-aging strategies., and a lack of fluoride can lead to tooth decay that can result in the need for extensive and costly treatment. Gingivitis is an inflammation of the gums that is usually caused by bacterial plaque when oral hygiene is lax. If not removed by brushing thoroughly and flossing, this sticky film will eventually form hard deposits called tartar which can only be moved by a dental hygienist or dentist Gingivitis is left untreated my lead to more severe periodontal disease, affecting the soft tissue and bone and leading to tooth loss. Oral cancers involve the mouth, tongue, lips, and pharynx (throat). The primary risk factors for oral cancers are tobacco use and heavy alcohol consumption. Oral cancer occurs twice as often in males as in females and prognosis can be poor because many of these cancers are diagnosed in late stages. This is problematic because surgery in the late stages can be extremely disfiguring and survivors often have an increased risk of developing other cancers. Early diagnosis increases the chances of survival and therefore more research is necessary to improve methods of early detection. Cigarette smoking is known to be a strong risk factor for cancer, including oral cancer, as well as stroke and cardiovascular disease. It is also a strong risk factor for periodontal disease, accounting for up to half of disease. The excessive use of alcohol is also a high-risk activity that can lead to oral cancer, as well as alcoholic liver disease. Older adults should avoid smoking or using other tobacco products, use alcohol only in moderation, and enjoy a nutritious diet, even if they have lost teeth and have a more difficult time chewing fresh fruit and vegetables. Above all else, the earlier one develops good oral hygiene, the more likely one is to prevent any of the above.mentioned orel health conditions. Lifelong dedication to these habits can help ensure healthy teeth and good oral health for a lifetime.